USA Roller Chain and Sprockets (USARC) is one of the nations leading suppliers of industrial and agricultural pintle chains and pintle chain sprockets. Our pintle chains are dependable, high-strength, and are available at unbeatable prices. We supply these chains to the general public, re-sellers, manufacturing facilities, and many municipalities across the nation. What sets us apart from the other guys is our extensive pintle chain selection and inventory, attachment availability, A+ BBB rating, and expert customer service. We are a dedicated medium-sized family owned and operated business that works tirelessly to support our customers, even after the sale is made. There are several different classes of pintle chain, 400, 600, 700, 800, and 900 class pintle chains. Each class is used in different types of applications and are typically in stock. 400 Class pintle chains are manufactured with high-quality cast offset-style links and hardened steel pins. These chains are available from stock with standard cotters or can be supplied with stainless steel cotters for extremely abrasive applications. Typically these chains are found in agricultural applications, water treatment facilities, conveying and drive applications, forestry, grain handling, and many more! We also offer a full line of sprockets, attachments, and other accessories for 400-class pintle chains. Our 600-class pintle chains offer superior performance, strength, and durability versus other 600 class steel pintle chains. We offer both an import and domestically made in USA version of these chains. 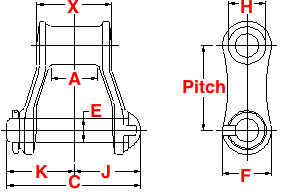 These are the most commonly used type of pintle chains because they offer such high strengths and long operation. These chains are typically found in agricultural applications, sand spreaders, manure spreaders, salt spreaders, conveyors, forage harvesters, baggers, live bottom trailers, and many more applications. If you need a complete trailer assembly with welded attachments or slats we can provide those, we also stock 600 class pintle chain sprockets, attachments, and chain breakers. We offer an extensive range of attachments for 600-class pintle chains. Our standard attachments include AE, AES, AK1, AS, SEF, G30S, G38, G50, K1, KG30S, KS and more. We stock pre-assembled standard attachment pintle chains and can supply a complete custom attachment chain with the specific attachment and specific spacing within a few days. Our 600 class pintle chain sprocket inventory ranges in tooth count, hub type (A-plate, B-Hub, Chub), bore size, and sprocket material (cast or steel). Also if we don't have the exact sprocket you need in stock or if the sprocket is a custom part we can manufacture it! 700 Class pintle chains are primarily used in clarifiers, bar screens, DAF, API, and other conveying applications. We offer cast, steel, plastic, and stainless steel 700 class pintle chains as well as a complete line of attachments and sprockets. This class of pintle chain is used in elevating and mining applicants. It features a specially designed pin and cotter to prevent breakage and if breakage occurs the chain will remain in tact. We can also supply 800 class pintle chain sprockets and elevator buckets.